Outlook: New landscape for drug chains? NEW YORK — Entering the second quarter of 2017, the chain drug industry was awaiting answers to a couple of big, lingering questions. First, what will the chain drug landscape look like? A significant change in the field of players is likely in store pending antitrust clearance of Walgreens Boots Alliance Inc.’s (WBA’s) deal to acquire Rite Aid Corp. The transaction, down over $2 billion in value since being announced in October 2015, had yet to be approved by the Federal Trade Commission at presstime. The FTC was still determining if an agreement by Fred’s Inc. to buy 865 or more Rite Aid stores would satisfy its competitive concerns. Overall, WBA may divest up to 1,200 stores. Second, what’s the future of the Affordable Care Act? Though President Trump and House Republicans stumbled in their initial attempt at health care reform, drug chains and other stakeholders will be watching for any further efforts to replace or modify the ACA. The expanded health insurance coverage brought by the ACA, estimated at around 20 million people, has given pharmacy retailers a lift in prescriptions and related services. But those gains could evaporate — or worse — if Trump and the GOP ultimately succeed with a major alteration or replacement of the ACA. If the Walgreens-Rite Aid merger is approved, the industry would go from three dominant chains to two — Walgreens and CVS Pharmacy — and see a new large drug chain in Fred’s, which would more than triple its pharmacy count. Assuming the WBA-Rite Aid deal goes through, Walgreens would become the largest U.S. drug chain, with roughly 11,500 to 12,500 stores (depending on divestitures). CVS Health would be No. 2, with more than 9,600 CVS Pharmacy locations, including over 1,600 inside Target Corp. stores. Far below them would be Fred’s at No. 4 with more than 1,200 pharmacies (depending on divestitures), and further below that as the No. 5 U.S. drug chain would be Kinney Drugs, with about 100 stores. Both Agnese and Silverman said the Walgreens-Rite Aid deal would be the last large-scale merger within the chain drug store segment. Any further consolidation would involve companies outside that arena. CVS, WBA, Express Scripts, Walmart, Rite Aid and OptumRx represent the “top tier” of dispensing pharmacies and, combined, drove about 62% of U.S. prescription dispensing revenue last year, reported pharmacy supply chain expert Adam Fein, president of Pembroke Consulting and chief executive officer of the Drug Channels Institute. According to Fein’s “2017 Economic Report on U.S. Pharmacies and Pharmacy Benefit Managers,” the rest of the top 15 U.S. dispensing pharmacies includes food/mass retailers, health insurers, a PBM, a specialty pharmacy and a long-term care pharmacy: Kroger Co., Albertsons Cos., Humana (Pharmacy Solutions), Prime Therapeutics, Diplomat Pharmacy, Cigna, Costco Wholesale Corp., Ahold USA and PharMerica. Despite holding the largest share of dispensed scripts, retail pharmacies are seeing their share of industry revenue wane amid a mature generic drug market and a surging specialty drug space, Fein noted. According to his report, the largest PBMs and insurers represent 60% of specialty dispensing revenue. In the broader health care marketplace, Trump and Republican leaders last month saw their ACA replacement bill, the American Health Care Act (AHCA), fizzle in the House as it failed to come to a vote. But ACA opponents aren’t likely to throw in the towel over the long term. One obstacle for the AHCA was concern that it could cause millions of Americans to lose health and pharmacy benefits. In March, the Congressional Budget Office (CBO) released a report on the AHCA estimating that for the 2018 plan year 14 million more people would be uninsured than currently under the ACA. The uninsured figure would then rise to 21 million more in 2020 and 24 million more in 2026. CBO estimated that 52 million people overall would be uninsured under the AHCA by 2026, compared with 28 million under the ACA. 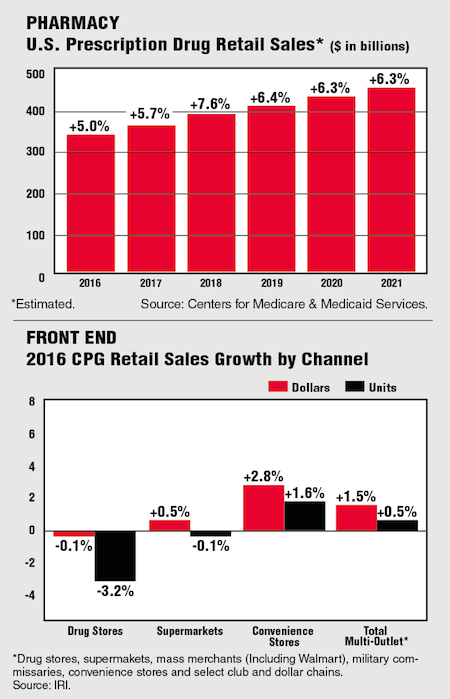 “While we see continued retail pharmacy gross margin pressure from reimbursement rates, we believe retail pharmacy margins are at the lower end of the pharma chain. As independents are likely operating at even lower margins than those of the large chains, any significant changes to margin structure could materially impact their financial health, which could negatively impact consumer access to health care,” said Fitch health care analyst Bob Kirby. Longer-term demand would be squeezed if people lose health coverage and must pay cash for prescriptions, CFRA’s Agnese said. That scenario could steer many uninsured consumers to non-drug store retailers.